Belt conveyors are used in many industries where a smooth continuous flow of product is required under control. 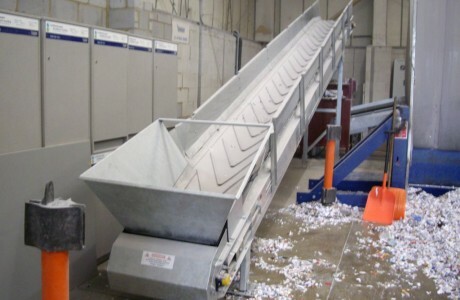 Due to their ability to handle all shapes and sizes they are used many different environments such as carton/parcel traffic, aggregate handling, food processing, to name a few. Belts come in a wide range of widths from 100 – 2000mm and styles i.e smooth, gripfaced, ribbed or flighted depending on product and application. They are also constructed from rubber, PVC, plastic or steel, again dependent on product/application. The two main types of construction are slider bed and roller bed, the latter being used where heavier loads are anticipated. Drive units can be supplied either single or 3 phase. Typical ancillaries include slave driven infeeds, noseover units, bends etc. Various conveyor speeds available. Full technical specification for the these type of conveyors available on request. AHS have vast experience in the design, specification, installation and maintenance of Belt Conveyors. For further information, please contact us and one of our representatives will be straight back in touch.